The memorial consists of a large roughhewn block of granite about four feet high on a base of roughhewn granite with a bronze plaque set into the stone. The plaque has an ornate frame that is part of the casting. Featured on the plaque are war scenes in relief. At the top left is a battleship with the name AMERICAN LEGION, top right is a biplane, bottom left is a scene of soldiers charging into combat and the bottom right scene shows artillery in action. Centered inside the frame with the scenes above and below is a shield, also in relief, with the inscriptions and list of those who died. At the top of the shield above the inscriptions appears the American Legion Logo. A cold, windy day led to a smaller than expected crowd of 10,000 cheering people turning out for the dedication ceremony. Speakers included Governor Cameron Morrison, General Andrew J. Bowley, commanding general at Ft. Bragg, Congressman Tom Connally of Texas and Colonel Wiley Redman commander of the North Carolina Department of the American Legion. The dedication speech was given by a former Gastonia mayor, R.G. Cherry who had served as a captain with the 113th Machine Gun Battalion, 30th Infantry Division. Two young girls, the daughters of veterans then unveiled the memorial. Afterwards the veterans present were served an elaborate dinner and the day’s festivities included a football game, boxing matches and a Mardi Gras festival. During Governor Morrison’s speech an airplane flown by a war ace performed stunts over the crowd. 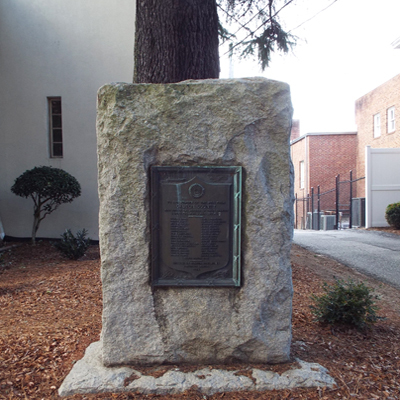 The memorial is located in front of and to the right of Gaston County War Memorial Hall at 109 W. 2nd Ave, Gastonia, NC. The Memorial Hall was dedicated in 1930 to honor veterans of all wars. This building now houses an American Military Museum. Several other military related markers and memorials are attached to the building walls and occupy the grounds around the building. 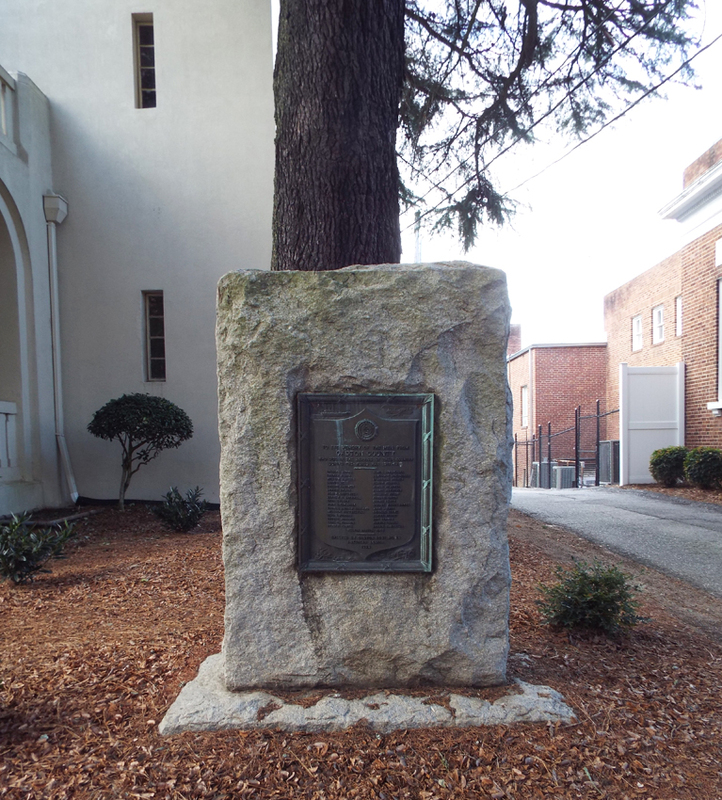 Revolutionary War Plaque is attached to an outside wall near the entry door to the Gaston County War Memorial Hall. World War I and II Dead Plaque stands at the sidewalk directly in front of the building. The memorial stands on the front lawn under large shade trees. The marker was originally placed at the old Gaston County Courthouse which still stands and is on the National Registry of Historic Places. That courthouse is located at the intersection of N. York Street and South Street. The marker was relocated to War Memorial Hall in 1954 although the former courthouse was still in use until 1998. The monument stood in front of and slightly to the left courthouse.